When the development of Command and Conquer was in full swing in the early 90s, Westwood Studios receptionist Kia Montgomery was invited to read some lines by the audio team. The janitor's closet, which would later become Westwood Studios' server farm, was hastily converted into a recording studio, and Montgomery read some lines. The next thing she knew, she was being cast as EVA, the familiar contralto that serves as the voice of Command and Conquer's AI. "I was just tickled pink that they had liked it and wanted even more," Montgomery said. Montgomery wasn't the only staff member to suddenly find herself with a speaking role in Westwood's groundbreaking real-time strategy game. Joe Kucan, who was in charge of casting, became Kane, the game's iconic villain. Eric Gooch, who worked on the video, was cast as Seth, the hapless Brotherhood of Nod lieutenant who is killed during one of the game's briefings. It was all part of the broader DIY spirit that pervaded Command and Conquer's development. Former Westwood developers Louis Castle, Erik Yeo, Frank Klepacki, and Steve Wetherill were all on hand to share their stories at GDC 2019, and so were a half dozen other developers, who shared their stories via video clips. They talked about making the game's iconic briefings, its familiar live-action video, and its multiplayer, which felt avante garde in the mid-90s, but were mostly hacked together. Command and Conquer wasn't the first real-time strategy game, but it was one of the first to popularize the genre. Along with WarCraft 2 and DOOM, it helped to popularize online multiplayer, and it made Westwood one of the era's most popular studios. It was also one of the few games to be lauded for its charmingly cheesy FMV cutscenes, mostly because they were far more than a bunch of D-grade actors on a soundstage. Command and Conquer played with the form, using unique overlays and cut-ins to make players feel as if they were actually a commander for The Brotherhood of Nod or GDI. Here are a few more stories of how it all came together. The games industry suffers tremendously from developers working themselves to death. Nevertheless, many of the best features arise from developers working on passion projects over their lunch hour or during the weekend. Producer Ed Del Castillo remembers, "My favorite memory revolved around the things we did that as unasked for and unexpected that pushed the product above and beyond. For me, it was the mission briefings. We were going to do briefings that were just straight teletype, but the team was so enthused about the game that it didn't just seem like enough. So we hit on the idea to take the television graphics and put them on top of the briefing to create something people hadn't seen before." Using Lightwave, Del Castillo and other developers worked to build an extremely "bootleggy demo." They produced maps and graphics that turned the screen into an interactive portal into the game's world. "We spent the whole weekend barely sleeping to put graphics on the briefing," Del Castillo remembers. The result was FMV cutscenes that stood out dramatically when put up against competitors like WarCraft 2, which featured a simple text scroll. The story was related through these briefings. At one point, Seth tries to bring you in on a rebellion against Kane, only for a gun to come in from out of the frame and fire at point blank range—a moment that serves to drive home how dangerous Kane could be. All of this was extremely cool at the time, and it added to the experience in a way that simple teletype briefings never could. 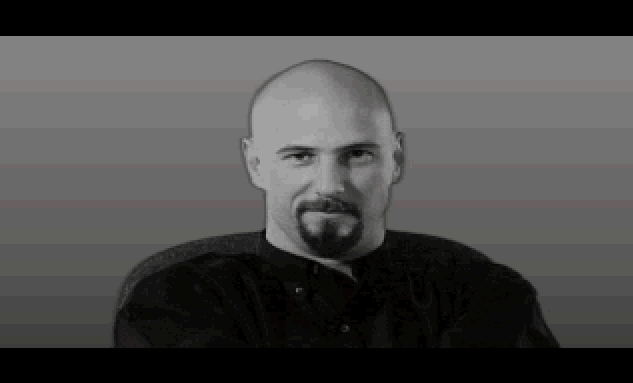 Joe Kucan was tasked with finding performers for Command and Conquer. Kucan had a theatrical background, meaning that he had access to plenty of actors. But many of them were "community theater people," meaning they weren't professional actors. "I talked to the talent agencies in town," Kucan remembers. "We were getting access to performers from the [Las Vegas Strip] who were looking to expand what they did." General Sheppard, who leads the GDI faction, was one such actor. According to Kucan, he got his start as a Blues Brother impersonator on the Strip. Kucan also found himself pulling in numerous people from the studio itself. Kucan himself became Kane. Montgomery, who as a receptionist was responsible for most of the studio's automated voice messages, became EVA. Eric Gooch remembers being recruited to play Seth. "[Joe Kucan] looked at me and said, 'Oh crap, we forgot to cast Seth. You can be Seth. You want to be Seth?' And that's how Seth was created." And sometimes that's how a new character is born. Command and Conquer had pretty strong production values for the early 90s, but its setup was hilariously low-tech by today's standards. Gooch remembers, "It was so seat of the pants it was hilarious. We had rented this big empty warehouse. We didn't even have chroma key paint. I went to the hardware store and bought some green paint, and that was our first green screen." Kucan remembers, "Everything was shot on stage with a dead-on camera. We were sort of bouncing on a suspended floor. It feels very primitive in hindsight. I didn't think it felt like that at the time. It felt very brave and new and avant garde." Command and Conquer mostly hid its low-budget production behind clever editing and graphical tricks. The first cutscene is incredibly clever: an unseen TV watcher rapidly clicks through channels, which serve to establish the world. Jazzercise channels are interspersed with news updates and explanations of Tiberian, the Nod sometimes appearing the background. It was an approach that served to define Command and Conquer's look and feel years after FMV fell out of style. Command and Conquer of course went on to become a huge success, and Westwood subsequently had a much larger budgets. But in some ways, higher production values only served to further drive home the inherent cheesiness of Command and Conquer's approach. The original game was endlessly clever in the way that it told its story, and that's why it holds up so well today. Sadly, it's been a long time since we've had a new Command and Conquer game. But there are signs that EA is coming around on the series. A Command and Conquer Remaster is currently underway, and will reportedly have input from fans. It's been almost 25 years since the first game, but hopefully it retain that distinctive spirit of DIY that made the original so memorable. Tagged with Electronic Arts,	Feature,	PC,	Retro,	Strategy,	westwood studios. Command & Conquer 3 and Command & Conquer Red Alert 3 are available now.